to shallow skin yellow, pale yellow flesh. Plant: Medium height, semi-upright habit, intermediate type. pigmented, with developed wings, straight. small leaflet, elongated oval (I = 1.86); limbus plan. Flower: Purplish red, partially pigmented flower bud. 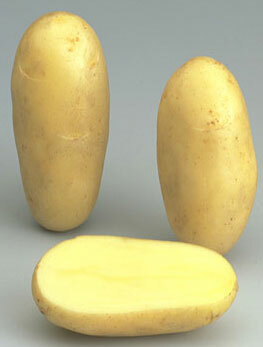 Grading: Proportion of large tubers: fairly low to medium. Susceptibility to diseases: Leaf blight: fairly susceptible. Virus A: NTR Virus Y: susceptible to very susceptible.